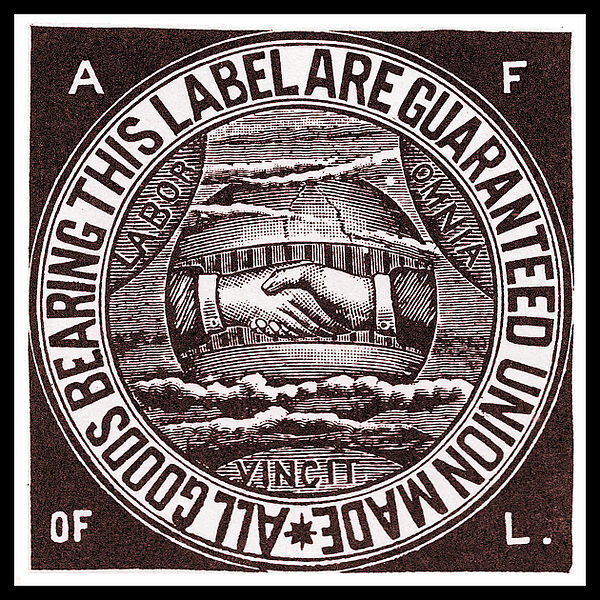 Label of the American Federation of Labor (AFL), circa 1900. Image from Wikimedia Commons. After World War I workers believed it was time to unionize everybody who worked. 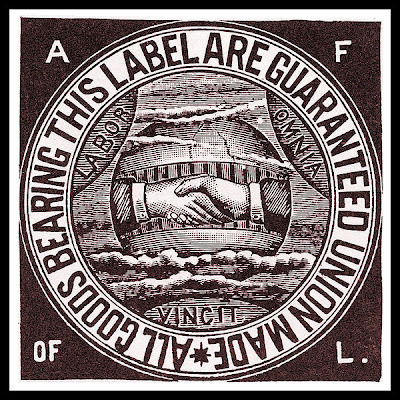 Some organizers came out of the American Federation of Labor (AFL), some were enthusiastic followers of the Industrial Workers of the World (IWW), some were members of the Socialist Party -- followers of Eugene V. Debs, and many were inspired by the Bolshevik Revolution. Workers launched two nationwide strikes in steel and meatpacking. The ruling classes responded with force and fraud. As to the former, they used a multiplicity of means to crush strikes and they jailed and deported known radicals. The United States government participated with other regimes to intervene in the Russian civil war and to isolate the new revolutionary government diplomatically and economically. As to fraud, corporations initiated various worker-management schemes to mollify worker discontent: from sporting activities, to counselor home visits, to the establishment of human relations departments. Also businesses embarked on a huge campaign to stimulate consumerism, including catalog purchases of products to buying on time to creating an automobile culture. Force and fraud worked. Labor union membership and worker militancy declined even though wages and working conditions did not improve substantially. But by the late 1920s strikes in textile and mining occurred. With the onset of the Great Depression, radicals were organizing Unemployment Councils in urban areas. Dispossessed farmers began their long trek to the West Coast seeking agricultural work. In 1934 alone, general strikes occurred in San Francisco, Minneapolis, Toledo, and Akron, Ohio. In the late 1930s, workers in South Bend, Indiana, and Flint, Michigan, added the “sit-down strike” to the panoply of militant tools used by workers to demand the right to organize unions, fair wages, health and safety at the work place, and pensions. Many of their goals were achieved by the 1950s. 1953 was the peak year for organized labor. Thirty-three percent of non-agricultural workers were organized. Then union membership began a slow but steady decline. The Reagan “revolution” brought a return to many of the strategies of force and fraud employed in the 1920s. Declining worker power was dramatic. Both Republican and Democratic administrations used administrative tools, outsourcing of jobs, so-called free trade agreements, and outright banning of rights to collective bargaining in various sectors to crush unions. But as history shows, workers from time to time fight back, regain the rights they lost in prior eras, and continue the process of pushing history in a progressive direction. The last year has been such a time for fight back. Workers in Cairo, Madison, Madrid, Athens, and Wisconsin, Ohio, Indiana, and all across the globe are rising up. In the United States the most recent example is that of the Chicago Teachers Union. Public sector workers have been hit very hard in recent years. Government officials rationalized anti-labor legislation as necessitated by fiscal crises. But these fiscal crises lead not to the end to services but to their privatization. Teachers, librarians, firefighters, and others are laid off and replaced or rehired at wages a third less than they made as unionized public sector workers. Chicago teachers have said no to this scam. They are fighting against the privatization of public schools, demanding the maintenance of job security for teachers so they can continue to meet the needs of children, and are standing up for the principle that all children, not just children of the wealthy, are entitled to the best education that the society can offer. Throughout history workers’ demands have been beneficial for everybody. Revisiting history can provide useful lessons from the past for the present. They are not specific roadmaps for action. But what the lessons of the past, the militancy of the last year, and the mobilization of Chicago teachers suggest is that now is a good time to think about all workers -- in factories, on construction sites, in offices, in universities, everywhere -- organizing unions. There is power in the union.